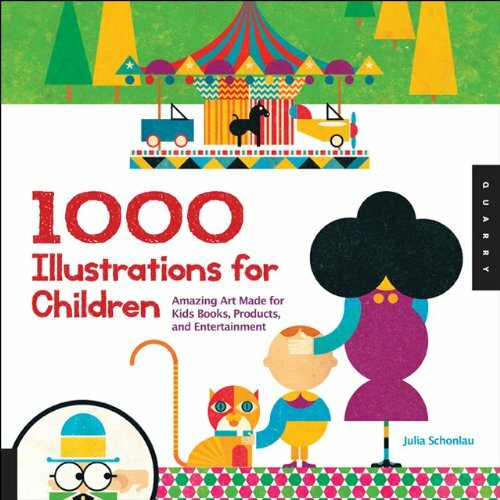 1000 Illustrations for Children is a wonderful collection of children art curated by Julia Schonlau. It's a 320-page paperback and the colour reproduction is well done. 89 artists from all over the world contribute to the 1000 artworks in the book. There's a nice variety of visual style to look at, from hand drawn art to digital creations. The illustrations are cute, imaginative and beautiful. Most importantly, they look appealing to kids, and are visually interesting enough to instil a sense of wonder and imagination. Each artist has a small but good collection of work featured. Websites for the artists are also listed. Some of the artists included are Beatrice Alemagna, Maria Carluccio, Tad Carpenter, Dan Santat, Bernardo Carvalho, Olivier Douzou, Delphine Durand, Beth Krommes, David Lucas, MEOMI, Melissa Sweet, Laura Vaccaro Seeger and many more. I got those names from the book's index. There are book descriptions online that give you artist names that do not actually appear in the book. For example, Wolf Erlbruch can be listed but his work is not in the book. This book's a good resource and reference for anyone looking for good children art. Not just kids, but maybe adults will also enjoy looking at the wonderful pictures too.